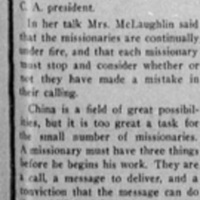 Article "Missionary From China Speaks to 'Y'"
This article describes a talk given by a missionary from China, Mrs. McLaughlin. During the talk, Mrs. McLaughlin described the various phases of life in China, and said that China offers a "field of great possibilities." She believes that the China is one of the most interesting countries in the world, but that it is also plagued by menaces such as famine and flood. Overall, she believes the Chinese to be a very courteous race. “Article "Missionary From China Speaks to 'Y'",” Race & Racism at the University of Richmond, accessed April 18, 2019, https://memory.richmond.edu/items/show/495.